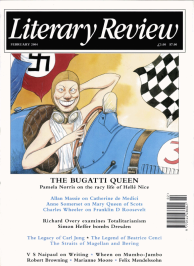 EVEN IF YOU have never thrilled to the drone of powerful cars jockeying for position on a racetrack, Miranda Seyrnour’s biography of the daring female driver Hellé Nice will have you riveted to your seat. The Bugatti Queen offers a gripping account of motor racing in Europe and America in the Thirties. It also has the charm and fascination of a fairy tale, being the story of a country bumpkin who transformed herself into a glamorous and much courted star. There was. however, more than a hint of hubris in the meteoric rise of the woman affectionately known as ‘Hellish Nice’ to her British fans. Her downfall was shocking and irrevocable, and Seymour’s account of her final years is as compelling as the history of her triumphs.